"Discover How To Start Your Very Own Successful Membership Site Today and FINALLY Start Earning a Regular Income From Your Online Business!" Membership Sites Are Big Business - and I'd Like To Show You How You Can Start Your Own ... Quickly and Easily! 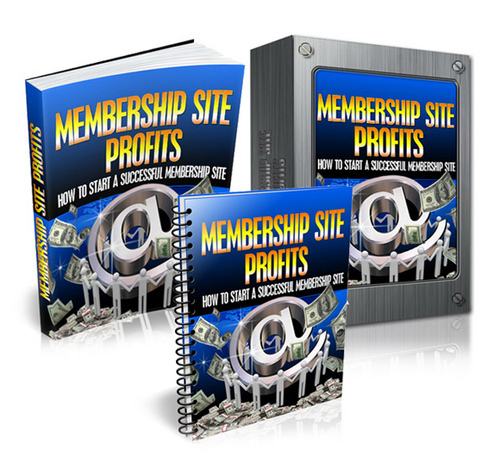 I'm sure you've already heard that starting your own membership site can provide great profit potential. You only have to look at the gurus to know just how lucrative they can be. Can you name a well known internet marketer who DOESN'T run their own membership site? What You Want To Know Is How You Can Get A Slice Of The Action! Running a membership site is not all plain sailing. Sure, the potential profits are great in theory - but things don't always work out quite as well in reality. "What? You're trying to talk me out of starting my own membership site?" Nope - not at all. I am just saying that if you want your membership site to be a success you need to know certain things. I'm sure you've noticed that the number of membership sites online has exploded in the last few years. They are everywhere - but what is sometimes kept hidden by the gurus is that lots of membership sites fail. In this book I'm going to share with you the things you really need to know if you want to make your membership site a success. How To Start Your Very Own Membership Site - Quickly and Easily. I'll take you through everything step by step, with lots of tips along the way to help you succeed. How To Find Members and How To Keep Them There! Selling your membership site to people in the first place is only half the battle... I'll show you how to make your site so engaging that they couldn't even THINK about canceling their membership! [YES] Can sell and keep 100 of the sales. Start Selling A High Quality Turnkey Membership Business! !